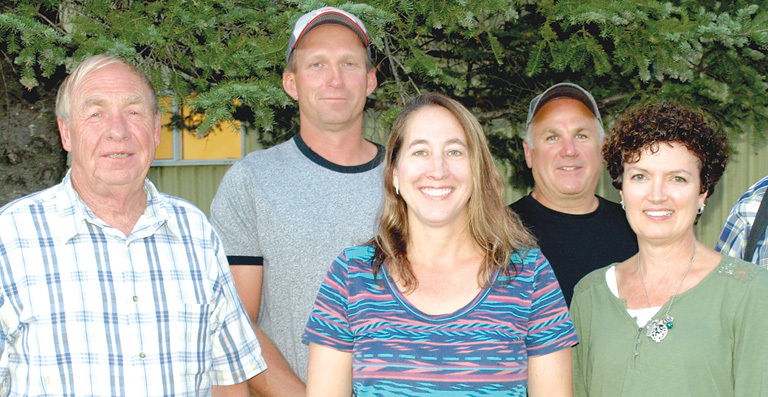 Camden Township officials include chairman/maintenance worker Gerald Goede, supervisor David Zellmann, treasurer Denise Zellmann, part-time maintenance worker Jeff Caswell, and clerk Lisa Goede. Not pictured are supervisor Bill Devine, deputy clerk Roger Sauerbrey, and deputy treasurer Elaine R. Wischnack. Camden Township Hall is located at 315 State Ave. S. in New Germany. The phone number at the town hall is 952-353-2496, and the website is www.camdentownshipmn.com. Meetings are conducted the second Thursday of the month at 7:30 p.m. at the township hall in New Germany. Serving Camden Township are clerk Lisa Goede (612) 280-8286, chairman and maintenance man Gerald Goede 952-240-9652, supervisor David Zellmann 952-467-4469, supervisor Bill Devine 612-419-9006, treasurer Denise Zellmann 952-467-4469, deputy clerk Roger Sauerbrey 952-657-2431, and deputy treasurer Elaine R. Wischnack. The township does not provide recycling, except for twice a year in conjunction with the City of New Germany. Call the household hazardous waste facility in Chaska, 952-448-4572 for recycling options. Building permits may be obtained by calling Carver County 952-361-1820. Residents may get burning permits by calling Carver County 952-361-1820. For dust control, call the township hall at 952-353-2496.